Students from the NSW North Coast Dojos competed in two competitions this October up in Queensland. 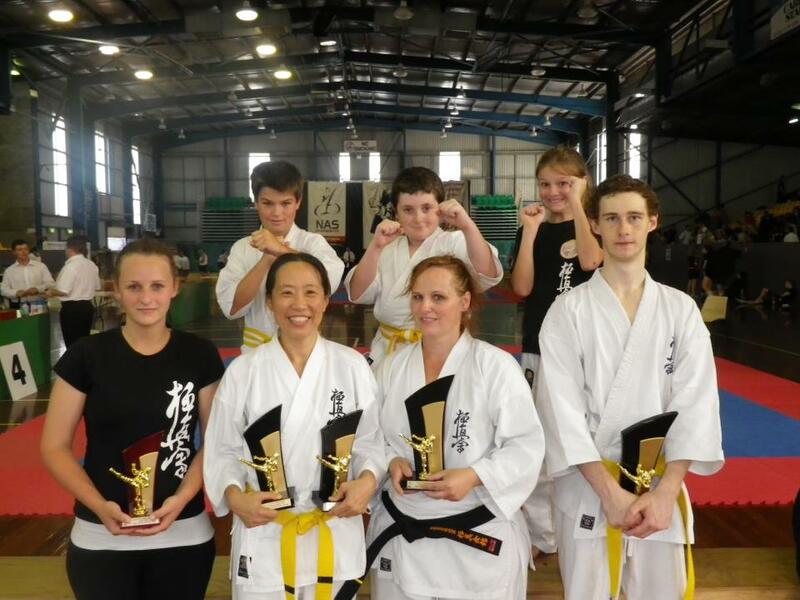 The team did incredibly well in the Australian Kyokushin Karate Association titles, held on Saturday October 20. Many students competed in the full contact and non-contact events. Of these Rian and Jeremy won placements in the contact event (1st and 3rd), and Courtney in the non-contact event (1st). The next day, October 21st, students also competed in the Queensland National All Styles. They entered in traditional weapons, point sparring, continuous sparring, kata and more. Jeremy Grey came 1st in continuous sparring, doing it the hard way with 2 draws and following on from the Saturday’s competition. Dianne Turner came 1st in the Queensland Veterans Women Continuous Sparring, and Trish Tan came 2nd in the same division. Trish also came 2nd in the point sparring at Kyu grade level. Those who did not win trophies still performed admirably, putting in the effort to train, to compete and perform their best. North Coast team that competed at the National All Styles, October 21.